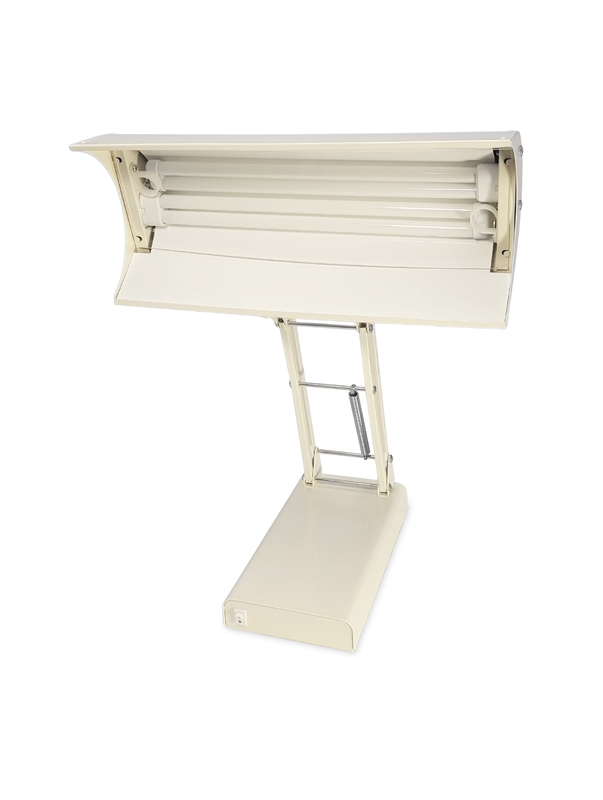 The Northern Light Desk Lamp is a top quality bright light therapy product. This powerful lamp is also completely adjustable. Enjoy 10,000 Lux with unmatched comfort. 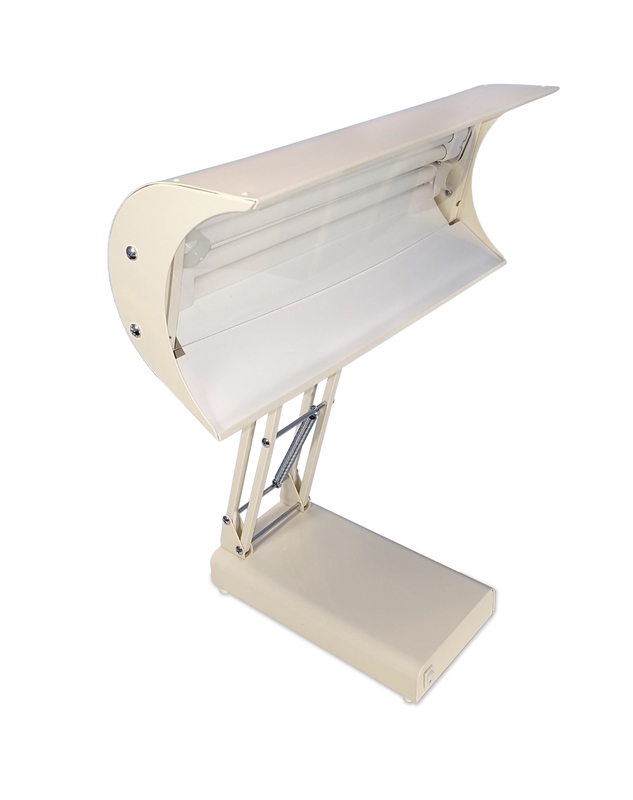 The Northern Light Desk Lamp delivers bright light by combining high-output fluorescent tubes with a large high-performance parabolic reflector. This results in a highly efficient unit that draws only 80 Watts, yet delivers 10,000 Lux at a comfortable distance of up to 18 inches. The power in our unit is channeled into light, not heat. The lamp height and angle adjustments allow you to obtain maximum comfort while enjoying the Northern Light Desk Lamp. 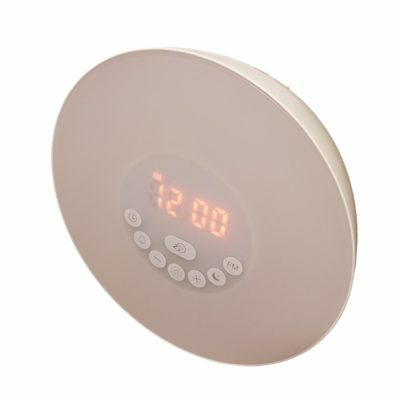 Additionally, our large reflector provides diffuse bright light without losing intensity rapidly as you move away from the lamp. The Northern Light Desk Lamp can also be used at home or at the office, for any task that requires bright lighting. 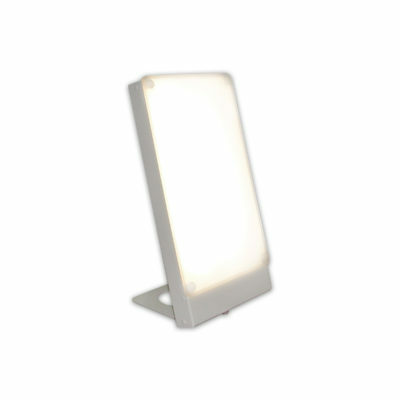 Our bright light products simulate outdoor light intensity. Just the like the sun, the Northern Light Desk Lamp shines down into your eyes from above and lights up your whole face. 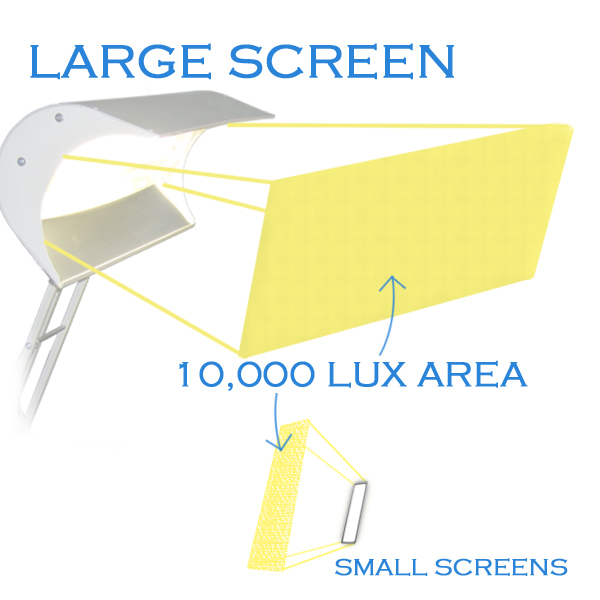 To get light therapy your eyes must fall in the 10,000 Lux area. This makes getting 10,000 Lux with small units very difficult because you need to sit very close and still. Universal – Lamp automatically selects from 110-270 volts, 50 or 60 hz. I take this product everywhere I go. It is easy to travel with. I have a separate one that I keep at work. I wish there were more colors. Great product though. I purchased this light a few years ago, and it has been great to treat my SAD. About 20 minutes in the morning and I can feel the difference for the rest of the day. A quality product and it works fantastic for SAD. 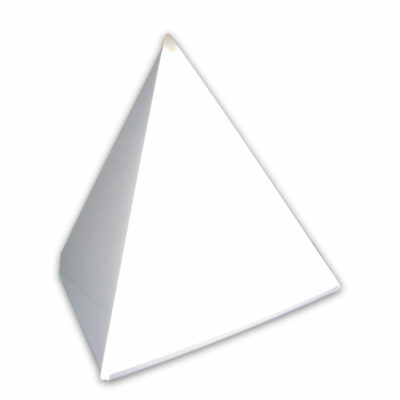 It is a bit bulky for travel purposes though, pretty much a stationary light. Amazing product. I have been using this for years and just bought another one as a gift. I highly recommend. Love this lamp, use it every single day! I’m a Family Doctor, and have used this same lamp for 20 years for SAD. My kids also use it now on winter mornings–we call it the “wake up lamp” at our house. Don’t forget to replace the bulbs every two years! I bought a used one earlier this year and have started using it for about an hour in the evenings while watching TV and on the laptop. Haven’t used it long enough to know of it’s effects but I’ll five-star it anyway. It’s a sturdy unit that will last an eternity! I am delighted to contribute a review. By chance, I found my description of the Chromolux 150 W bulbs. ($6.99 each)! I am an academic physician. Wonderful, sturdy lamp that was very helpful to my wife for many years. I purchased 3 extra bulbs initially to keep the intensity and spectrum as full and balanced as I could, as noted above, by one of my family physician colleagues. It has been in use for many, many years. Never a problem. Now it is used primarily as a desk lamp rather than for SAD relief. I’m back using the old bulbs. They clearly last longer than 3,500 hours. The effect is subtle but for the correct individual it adds another component contributing to improvement in mood. I own two, which I use for my oil painting (and I may be purchasing a third). The spectrum emitted from the light are similar to sunlight at the perfect time of day for a full spectrum of color. Also, this light is great for my SAD. When I use it, I feel better very quickly. I would suggest getting one of these even if you do not have SAD. If you are an artist, it will also allow you to paint inside, and get a similar spectrum as if you were working in the sunlight. The light, since it is florescent, also diffuses, which is great for artists because you don’t get much shadowing. Thank you for your review. I am very glad to hear our lights have been able to help you with your SAD and with your art. 13 years ago, I was hospitalized for depression in the Pacific Northwest. Luckily, a psychiatrist was well educated regarding SAD and prescribed this lamp. It helped me to climb out of depression and live a vibrant life again. I am deeply grateful. I have had two lights over the years but this one has lasted me 15 years or more of lighting. Currently it is not working and I certainly can feel the difference. I am not as happy and energetic as I was. I see my psych doc in March and hope to get a replacement. Great lamp, a definite must buy. I have two of these and I really notice the effect of using them! I had a ballast go bad in one and sent it to Northern Light for warranty work. The package was lost and misidentified. After some work on their part they verified that the package had reached their facility and then they sent me a new lamp. The lamp looks slightly industrial and that just means it is well built to me. I was diagnosed with SAD officially in 2006 but suspected it long before then – during the 1990s, the office I worked in had no natural light – only ceiling-based fluorescent – and I found myself falling into moderate depression each year between the time when daylight saving time ended and the time when it began again the following year. Once I had been switched to an office with floor-to-ceiling windows with abundant natural sunlight, the problem disappeared so I recognized that I likely suffered from the disorder. My sister, who also worked in government, had a fellow worker with the condition and when the person retired and left this lamp behind, she obtained the lamp for me and I used it to “self-medicate” for my (at the time) undiagnosed SAD. This lamp is one of the best I have come across and still provides relief for my symptoms more than a decade after I first acquired it. It is of top quality and, unlike others that I have tried, doesn’t “blind” me by having to look directly at the bulb(s) – the combination of the U-shaped full-spectrum fluorescent tube and the parabolic reflector behind it spreads the light out and diffuses it into a beam that isn’t difficult to look directly at – plus it also ensures that the half of the light generated by the back of the fluorescent tube is redirected to the front of the lamp instead of being lost/absorbed where it cannot be seen, making it a very effective treatment device that directs virtually all the light generated by the source forward to where it is most needed. Living along the 45th parallel, it has proved to be an excellent item for treating my disorder efficiently and effectively with great efficacy during the dark times of the year when most needed. I highly recommend this lamp to anyone suffering from the “winter blues” or with an suspected or official diagnosis of Seasonal Affective Disorder. 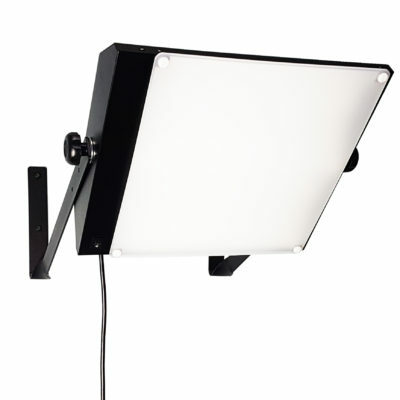 Additionally, it makes a great desk lamp for reading or for doing any form of fine work that requires a bright and diffuse full-spectrum light source – there are no bright and dim areas in the light field unlike some others I’ve tried – just a wide and universally consistent light field is created anywhere the reflector unit is directed towards. I’ve even used it successfully as a grow light for my houseplants to provide supplemental light to keep them healthy and vibrant over the winter months. This item has so many varied uses to which it can be put and it performs them all admirably and reliably – and is solidly built, well-balanced, and easy to adjust. I can’t recommend this lamp more highly – it is a superior piece of kit and provides me relief from my condition along with a myriad of other uses. If it were possible, I’d have rated it 7 stars out of 5 for all the extra uses for this light provides beyond its awesome treatment of providing complete relief of my SAD. Wow, thank you so much for the remarkable review. It is so great to hear feedback from people still getting great use out of one of our products after so many years! I am amazed at your attention to detail in our manufacturing and design. You are quite correct that every part was made to put as much light forward while keeping it easy on the eyes. The only thing I would mention after having a light for over 10 years is that the bulbs may dim a bit. If you feel like you’re not getting enough light you can always replace the bulbs. Many hardware stores will carry them (bring them with you so you ensure you get the right ones) or you can purchase some from us online. Hope it keeps the coming winter bright and all your plants happy too! 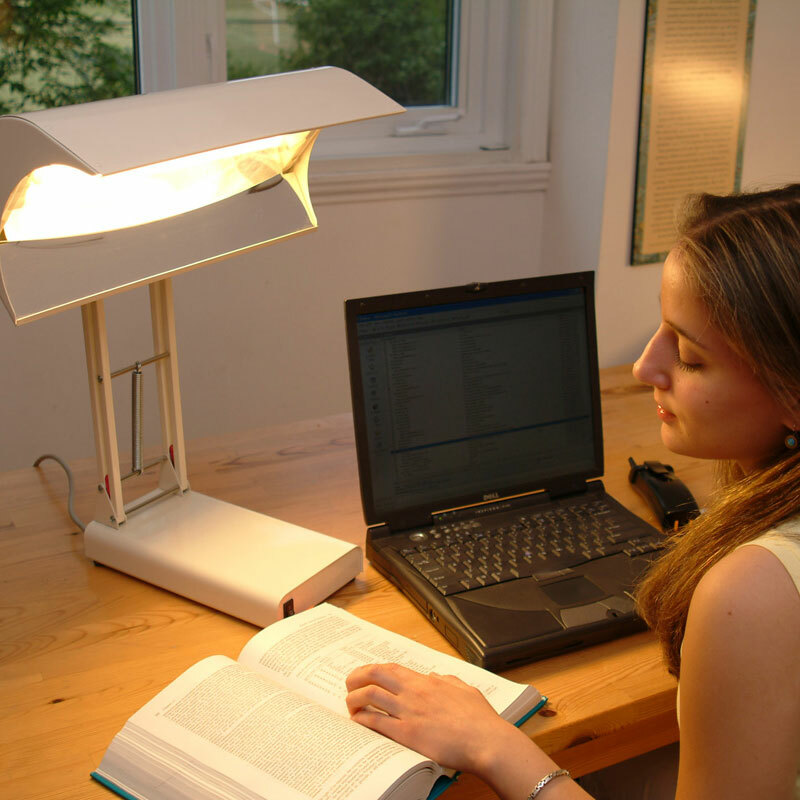 This desk lamp provides instant relief from severe seasonal affective disorder. I feel the effects from the first treatment and they last the whole day. I’ve tried many other products and technologies. This is the only lamp that works for me. 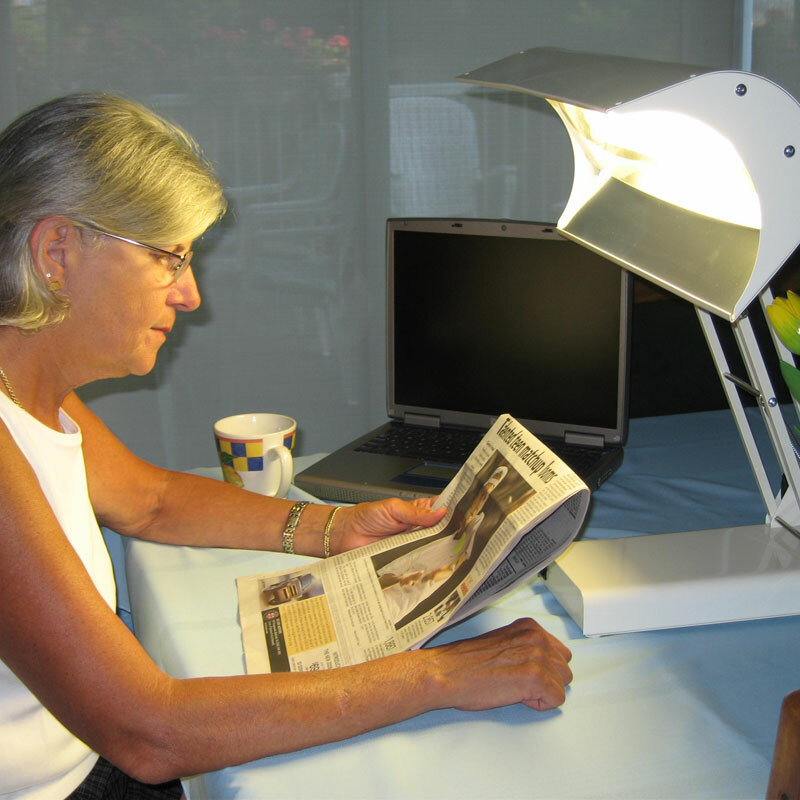 1) Does this lamp help improving vitamin D levels in the body ? 2) Is there a user manual i can have please ? Hi, thank you for the kind review and all the questions! Here are some answers for you and others who may be wondering the same thing. No. This lamp filters out UV. UV on the skin can help the body absorb more vitamin D. If you lack vitamin D you can take supplements. UV from tanning lamps can cause cancer and are not recommended. Vitamin D is not proven to help with winter blues or depression. 3) Is there a maximum number of hours we could be exposed directly to this lamp ? I use it on my desk. There is no maximum. I generally say if you use it to replace summer daylight hours is fine. Using bright light at night will keep you awake.